WASHINGTON -The sleek steel-and-wood architecture is similar. So is the assembly line front counter, the meat raised without the use of antibiotics or added hormones, and the gourmet spin on familiar cuisine. There’s no mention of Chipotle Mexican Grill anywhere at ShopHouse Southeast Asian Kitchen, which the Denver-based burrito empire opened here near Dupont Circle in September. But there’s no mistaking the formula. That’s why I was pumped to try ShopHouse, which has a similar build-your-own meal template, and is named for the buildings in Southeast Asia cities where families live above the markets they run on the street level. 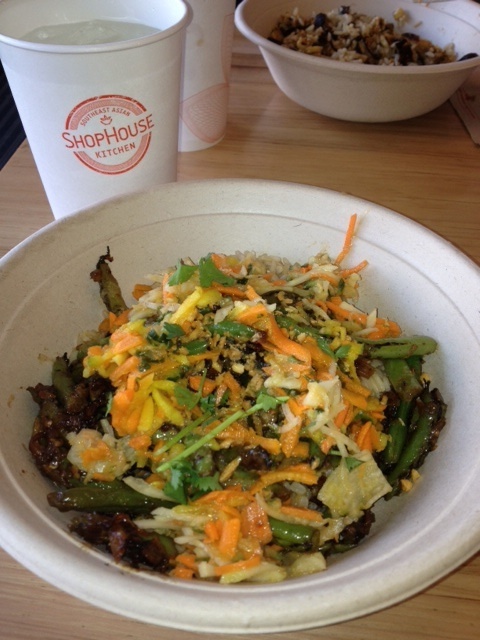 At ShopHouse, everything comes in a bowl, a deeper, rounder bowl than at Chipotle. Start by choosing either meat (grilled chicken satay, pork & chicken meatballs, or grilled steak) or tofu over jasmine rise, brown rice, chilled rice noodles, or a salad. Choose a veggie (broccoli, eggplant & Thai basil, green bean, or spicy charred corn), add a sauce (spicy red curry, green curry, or tamarind vinaigrette), a garnish (green papaya slaw, pickles, herb salad), and finally a topping (crispy garlic, toasted rice, crushed peanuts). It requires a little more thinking than ordering a burrito at Chipotle, but it’s a pretty streamlined process. Or you can make things easy by taking any of the meats/tofu and having a sandwich. I went with grilled chicken satay, broccoli, tamarind vinaigrette, pickles, and crispy garlic. The result was something spicier than a typical Chipotle burrito, requiring a drink refill, and something I’m anxious to try again. It was a bit of a surprise not to find a line at ShopHouse late afternoon as I had an early dinner with my wife and father-in-law before attending a Washington Nationals game. Apparently the place is crushed during lunchtime. I couldn’t help but think back to 2002, when my Core Performance co-author and fitness mentor Mark Verstegen introduced me to Chipotle in Phoenix when there were fewer than 200 stores. I wish that had inspired me to buy Chipotle stock when it went public in 2006 or in the immediate years thereafter, but if nothing else I gained an appreciation for how fast food can be health food. Ells likes to say that the success of Chipotle is due not to burritos but because of the restaurant’s philosophies. “It works because of our system: fresh, local, sustainable ingredients, cooked with classic methods in an open kitchen where the customer can see everything, and served in a pleasing environment,” he told Fortune.com recently. Do people want to eat Asian as often as Mexican? I probably would if there was a ShopHouse here in the Tampa Bay area, though I’d probably eat at Chipotle less. Such cannibalization apparently isn’t a concern. 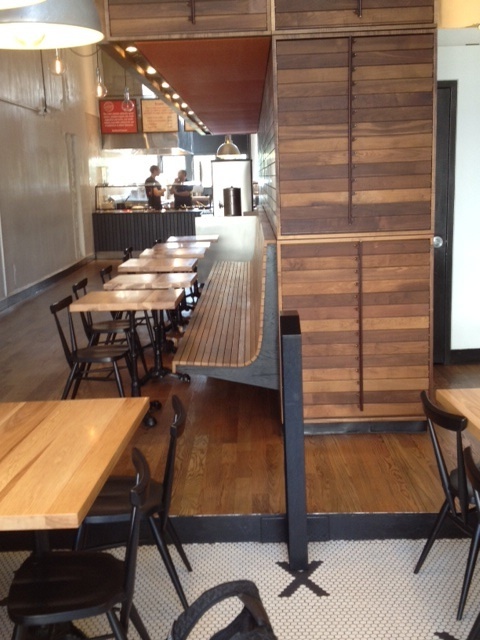 A nearby Chipotle on Dupont Circle hasn’t seen its sales suffer in the nine months since ShopHouse opened. 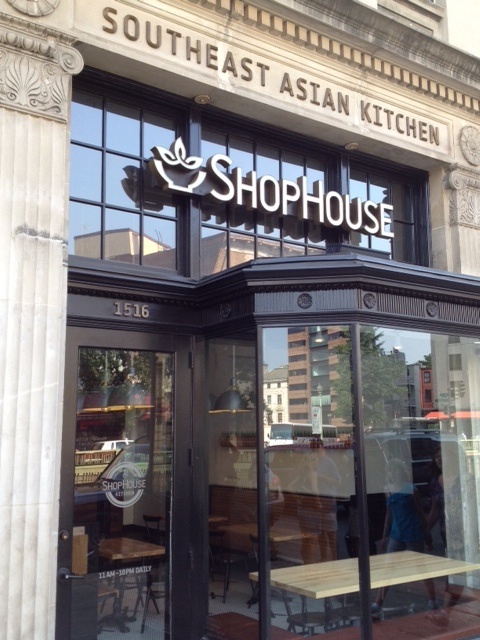 Unfortunately, ShopHouse expansion will be slow, with the second store not coming until September and also in D.C.
We won’t hold our breath on ShopHouse coming to Florida. Chipotle was 12 years old and had about 500 stores when it finally came to Orlando and Tampa in 2005. Let’s hope we don’t have to wait so long this time. Strength and endurance need not be mutually exclusive. 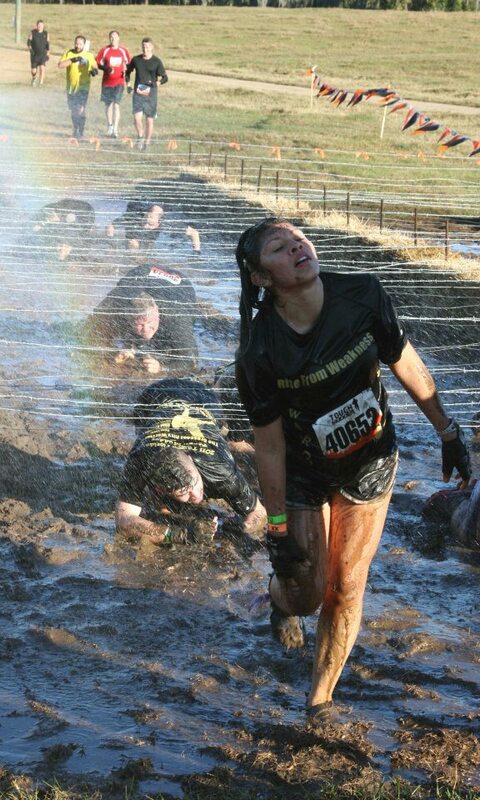 If you’re someone who has gotten into obstacle racing, you understand the importance of being able to demonstrate strength over both time and distance. In this recent segment for ABC Action News here in the Tampa Bay area, I teamed with trainers Sophia Zayfman and Nichole Franklin Falzon to show several moves that build strength endurance. We shot this at TNL Tampa, where I train regularly for obstacle races such as Tough Mudder, Spartan Race, and Savage Race. Olof Dallner was just 16 months removed from a major alpine climbing accident when he entered last weekend’s Spartan Death Race in Pittsfield, Vermont. The 34-year-old Swedish scientist, who has lived in New York City for the last three years, still feels some lingering effects from the accident in his left arm. But that wasn’t enough to keep him from winning the Spartan Death Race, perhaps the most mentally and physically taxing event in endurance sports. Dallner, who also won the inaugural winter Death Race in March, was in the lead when the Death Race was called on Monday – 67 hours after it began and with just 51 of 344 athletes proclaimed official finishers. 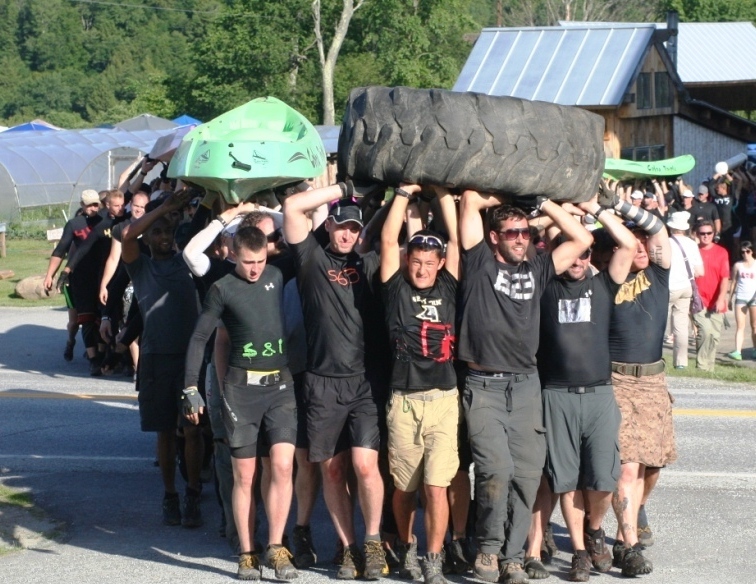 The obstacle and challenge-driven race required competitors to complete more than a dozen unusual, grueling mental and physical challenges throughout a 50-mile course in the dense Vermont woods. Some of the challenges included: a 25 mile/12-hour hike (done as a team challenge) carrying either a kayak, water filled plumbing pipes or a tractor tire above their heads; a 250 question exam with brain twisters; swimming in the Chittenden dam; form work including stacking hay bales; 1,000 Burpees; log chop; a 2-mile body roll through a sheep paddock; carrying a 50-lb bag of cement to the top of a mountain on a 3+ hour trek up and through a steep ravine and waterfall (and if the bag broke they had to head back down to get a new one); plus many more grueling challenges, all the while carrying all required gear, food and water in 40-lb packs. The theme of the race this year was “Betrayal” which came to life throughout the event. Organizers planted seeds of doubt and distrust in the competitors by declaring that they was open to mislead or betray other racers, but other competitors were there to potentially do the same to them. This format played havoc with the racers psyche. The ultimate betrayal came after 30 hours when a group of competitors planted by race organizers deliberately began cheating during a challenge. Once the other competitors saw how easy it was to cheat, many cheated. But when confronted they understood that cheating was not without consequence. The penalty for the cheat was 6-hours standing in a 45-degree pond and other comparable tasks. “I’d see people get betrayed and they’d get angry and quit but that’s part of the game,” Dallner said. Dallner said his toughest challenge was something called “The Roll,” where competitors had to roll side-over-side across a quarter-mile field strewn with pine cones, brush, and poison ivy for three hours. This is what Joe DeSena and Andy Weinberg had in mind in 2005 when they came up with the Death Race as an alternative to triathlons and other endurance races they felt had become predictable and routine. The idea was to create an event athlete couldn’t possibly train or prepare for in advance. The race has gotten longer each year as it seems organizers like to wait until 80 percent of the field has dropped out before calling time. Last year’s race went on for 45 hours. In 2010, DeSena and the gang launched the Spartan Race, which now features events at three different distances. Dallner said he got into Spartan Races after being sidelined for nearly three months following an alpine climbing accident in Vermont in February of 2011. 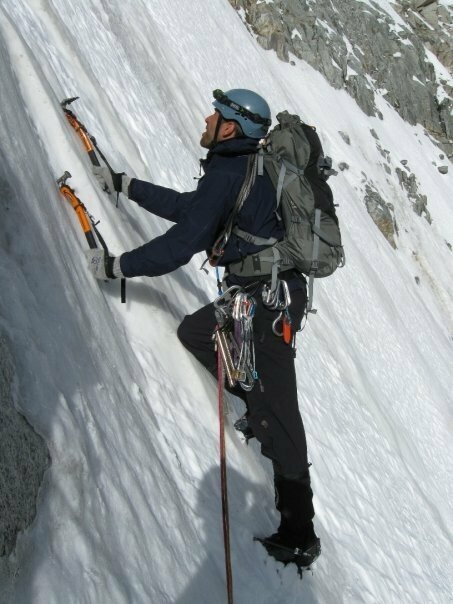 An ice pillar he was climbing collapsed, sending him on a 75-foot fall. His ropes held, but he still crashed against the wall, breaking his helmet in two. He spent four days in an ICU in New Hampshire and underwent surgeries to repair nerve damage in his arm. Dallner, who works in genetics developing a hormone that controls eating behavior, quickly discovered a knack for obstacle racing and won the winter version of the Death Race in just under 32 hours. Upon arriving at last week’s version of the Death Race, he reported that he did not meet the race requirement of generating media coverage prior to the event. Weinberg said he would have to swim 12 miles afterward, relinquish his title (if he won), or quickly come up with some media coverage. Dallner already is scheduled for both versions of the 2013 Death Race. Editor’s Note: David Adams, a University of Tampa student and U.S. Army veteran, is comparing obstacle race preparation and other training methods to the training he underwent in the military. In a series of stories for EnduranceSportsFlorida.com this summer, he’s writing about his progress. TAMPA – By the end of the first set, my muscles were tense and pleading with my brain to stop. I was standing with 20 classmates alongside a pavilion at Tampa’s Picnic Island pushing myself through “CrossBoot,” a CrossFit-like hybrid created by trainers Whit Lasseter and Vinny “Scoot” Fountain. Push harder, Lasseter implored us. I was sweating profusely, and my shoulders, quads, and calves were on fire. Each exercise challenged a different part of my body, and collectively they made for one really demanding workout. This was unlike my usual weight room routines, which was just the point. Over the last few years as fitness enthusiasts have been searching for better ways to condition the body, personal trainers have moved out of the gym. CrossFit coaches have transformed open space into a personal proving ground for anyone who wants to be in better condition. I recently met Lasseter, co-owner of Tampa CrossBoot fitness classes and The Facility Gym in Ballast Point, who invited me to attend a CrossBoot session and learn about what it means to be a CrossFit athlete. Lasseter and Fountain started Tampa CrossBoot more than a year ago, and since then the class has exploded, attracting not only CrossFit enthusiasts but athletes from many different backgrounds. CrossBoot’s routines provide a great cardiovascular workout, and weight routines during the sessions test physical strength. CrossBoot sessions are held eight times a week, with two classes on Mondays and Fridays, and once a day on Tuesdays, Wednesdays, Fridays, and Sundays. Lasseter and Fountain both run the CrossBoot classes, helping attendees maintain proper form and providing motivation to everyone involved. The popularity of Tampa CrossBoot has grown quickly. Although average class sizes vary from around fourteen to twenty people, Lasseter said it isn’t uncommon to see as many as thirty people arriving at class time to run the 60-to-90 minute gauntlet that is CrossBoot. With Tampa CrossBoot not even a year old, Lasseter and Fountain decided to buy a training headquarters, “The Facility,” in February and train people full time. The new gym offers classes ranging from Abs and Booty to Zumba. 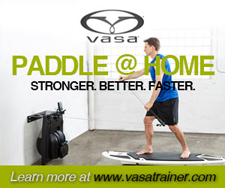 Power lifting, cardio kickboxing sessions, and various forms of yoga are also available. On Sunday, I made the trip to Picnic Island Park to meet up with Lasseter and Fountain for one of their CrossBoot classes. As I pulled into the gravel parking lot the class was just beginning. Nearly twenty people were already pushing their endurance, performing box jumps on the seats of picnic tables under a beachfront pavilion. Although the box jumps seemed like a pretty intense warm-up, I nodded. I was silently preparing myself for a very intense workout that would undoubtedly leave me exhausted afterward. I jumped into the class as they started their next partner-assisted exercise. One person conducted sit-ups, the other had to hold their ankles while they remained in the plank position. Each group had to complete 200 sit-ups before resting. Lasseter and I partnered, and Whit began knocking out sit-ups at an alarming pace. When she finished 50, we switched, and I completed my set of 50. During the next round, she did 60, leaving me thankfully only 40 to complete. I already was beginning to sweat, and we had just started. After sit-ups, the group began individual circuits, starting off with squat thrusts while holding a weight bar, followed by frog jumps. Pushups and GTOs (ground-to-overhead) with weight were the final two workouts, with a 400-meter run following directly after completion of the course. To complete the session, each person had to do descending repetitions, starting with 21 reps of each the first time and falling by three reps each subsequent circuit. When it was done, everyone gathered under the pavilion to catch their breath and congratulate one another on a successful training session. The group was getting ready to go to Adventure Island and have some fun together. Monthly “fun” days are now part of CrossBoot, making the class an even better idea for anyone who wants a workout that will push them to their limits and a place to meet fun people. The best part about CrossBoot is that no two workouts will be the same. ALL OVER VIRGINIA – This has only a little to do with endurance sports and nothing to do with Florida. But I spent Father’s Day in Virginia and figured I’d eat, drink, train, – and now write – however I pleased. I woke up in Newport News, where my cousin and her family live adjacent to the Mariners’ Museum Park, which is 550-acres of manicured trails and woods along Lake Maury. The 5-mile Noland Trail goes up and down hills, along the lake, and is quiet enough that I turned a corner at one point and came face to face with a doe, who remarkably didn’t move. 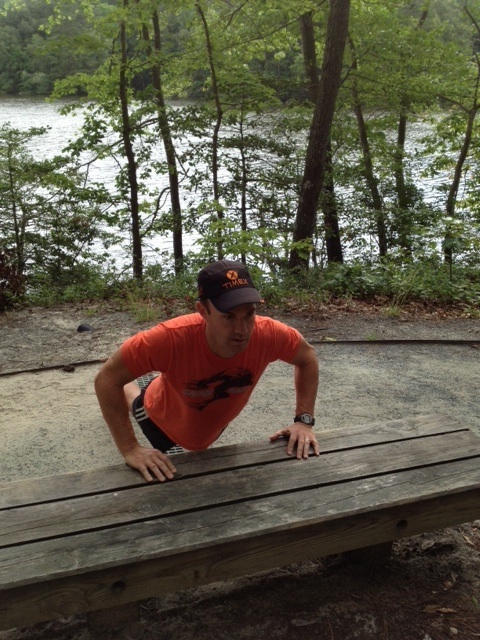 The trail includes 20 bridges and I decided in the spirit of obstacle race training, to find one obstacle per bridge – bench, picnic table, tree stump – and drop and do a set of 10 pushups and 10 dips. 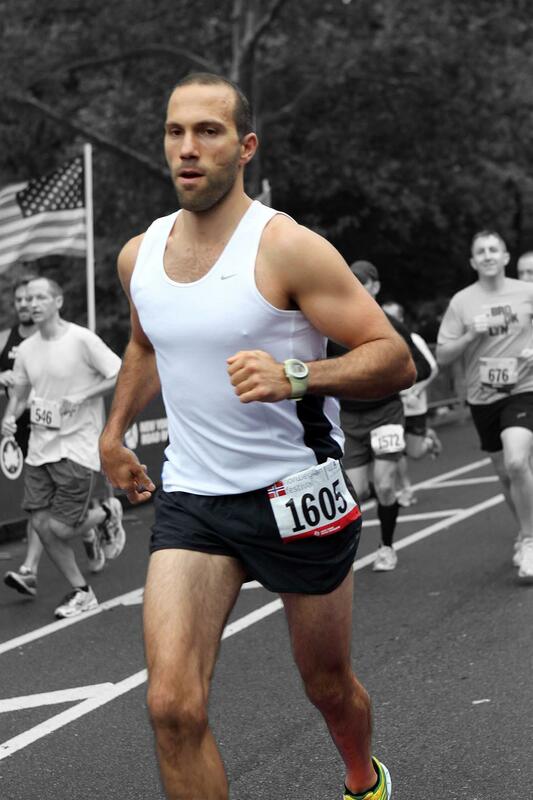 The 5-mile run, with 20 stops, took about 50 minutes. My cousin and her husband have lived in this section of Newport News for 25 years and in that time it’s become an unlikely college town with the transformation of Christopher Newport from community college to major university. If you’re ever in the area, check out the Mariners’ Museum Park. 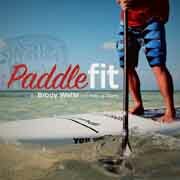 I only wish I had brought a paddleboard as Lake Maury looked perfect for SUP. The Richmond Flying Squirrels Double-A baseball team was playing across the street and we might have stopped if The Diamond still was home to Triple-A Richmond Braves (RIP), who played there when we lived in Richmond in the late 1970s. 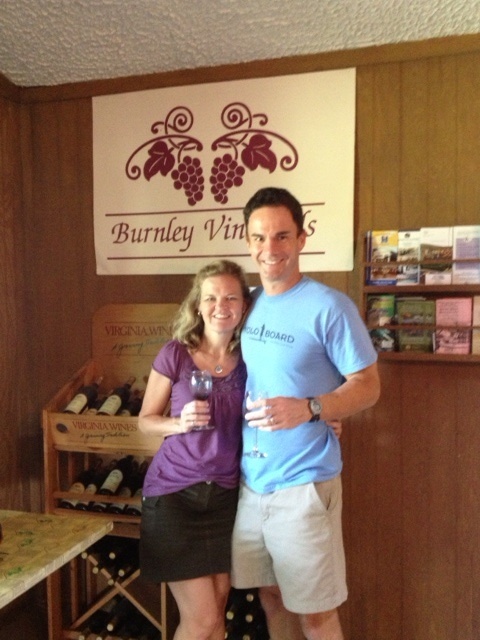 Instead we proceeded on course to Charlottesville, stopping in nearby Barboursville at Burnley Vineyards, our favorite winery. Virginia wine is very underrated. Thomas Jefferson started the U.S. wine industry in Virginia and the Commonwealth probably still would be the leader in U.S. wine production had the vines not been trampled during the Revolutionary War and again in the Civil War. By the time Virginia got caught up midway through the 20th Century, California had taken a commanding lead. With a case of Burnley wine in the van, it was on to Jefferson’s University of Virginia, where the plan was to have the second workout of the day at the UVA Aquatic Center, where our sons would have swam laps around me. We arrived in time to see swim coach Mark Bernardino instructing swim campers on the pool deck, but got the open pool schedule mixed up and didn’t get to swim. That will have to wait until tomorrow. 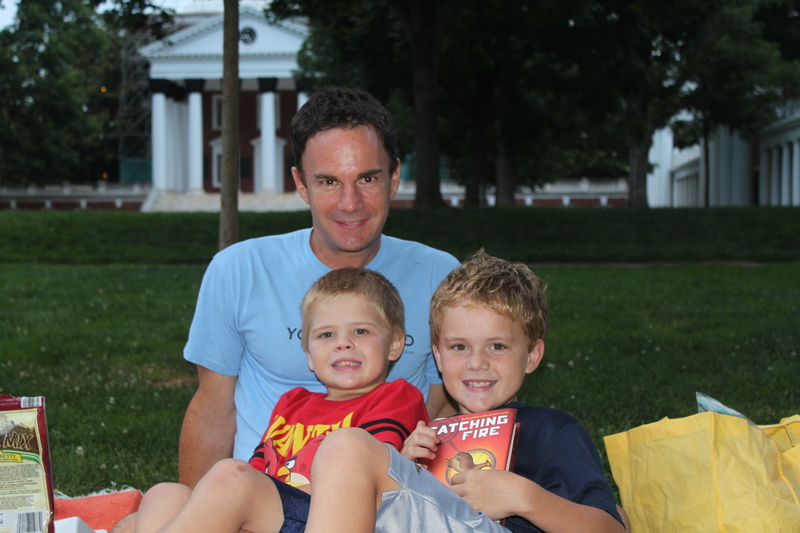 Instead, we wrapped up the day with a picnic on The Lawn as a late June sunset fell over the Rotunda – a perfect end to a perfect Father’s Day. Ready to go hog wild? The Hog Wild Mud Run, which takes place near Tampa on July 21, is offering a 2-for-1 discount to anyone who registers over Father’s Day weekend. Sign two people up on a team by 11:59 p.m. on Sunday by using the discount code WILD (case sensitive) and the second person gets in free. Register HERE. Athletes tackle Tough Mudder in Dade City last year. Tough Mudder has staged just one race in Florida. But the popular obstacle race series on Thursday switched venues for its Tampa area event for a second time. Tough Mudder sent an email to athletes registered for its Tampa race informing them that the Dec. 1-2 event, scheduled for Dirty Foot Adventures in Fort Meade, instead will be held at the Hi Hat Ranch in Sarasota. Geno Stopowenko, the marketing director for Dirty Foot Adventures, took issue with Tough Mudder’s announcement. According to Stopowenko, the move was made because Polk County refused to issue a permit for an event the size of Tough Mudder, which can attract up to 20,000 athletes over a weekend. Chandra Frederick, the director of Polk County’s land development division, said the application for a special use permit for Tough Mudder was denied because of concerns over noise and traffic. A permit was issued to Dirty Foot to host its own event, which took place last weekend when 869 athletes completed the inaugural Dirty Foot Adventure Run. That permit allowed for up to 2,000 athletes. 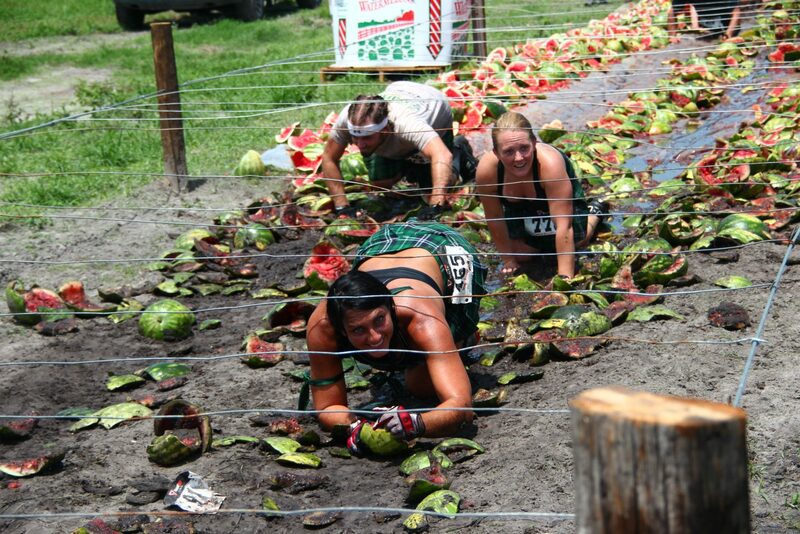 Athletes navigate the watermelon crawl at last weekend’s Dirty Foot Adventure Run in Fort Meade. Stopowenko said he applied in March for permits to host both Tough Mudder and the Dirty Foot Adventure Run. He said he informed Tough Mudder shortly thereafter when that permit was denied, but Tough Mudder continued to market the event as taking place in Fort Meade until Thursday. Tough Mudder spokesperson Jane Di Leo was not immediately available for comment on the Tough Mudder move to Sarasota, which is slightly closer to much of the Tampa Bay area than Fort Meade. Tough Mudder debuted in Florida to rave reviews last December at Little Everglades Ranch in Pasco County, just north of Tampa. But instead of returning to that venue, Tough Mudder announced in February that it was moving the event it bills as its “Tampa” race to Fort Meade, which is 60 miles southeast of Tampa. Di Leo said at the time that one attraction of Dirty Foot Adventures was its central location, just 60 miles from Tampa or Bradenton and 70 from Orlando or Sarasota. The sprawling facility is used for dirt bike and ATV racing. After last weekend’s inaugural Dirty Foot Adventure Run, Stopowenko announced a second race for Sept. 8. Little Everglades Ranch, which hosted the first Florida Tough Mudder, on Oct. 20 will host the Savage Race, which will move there after staging two events in the last 10 months in Clermont. Tough Mudder has announced dates but not specific locations for three 2013 events in Florida: Miami (Feb. 16-17), Jacksonville (May 18-19), and Tampa (Nov. 2-3).